Nano RAY-T develop a semi-industrial technology for obtaining materials (modifiers) on the basis of CNTs intended for insertion into liquid ink for 3D printing materials based on metal, plastic and other materials. The use of modifiers will significantly improve the physical and mechanical properties of materials (strength, electrical conductivity) and give a unique look and texture to the final products. This allows to use 3D printing not only for prototyping but produce things for real use, this will bring new opportunity for 3D printing market. 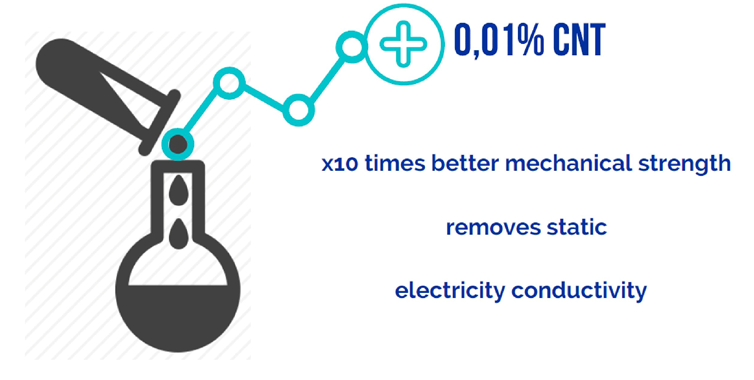 CNTs are of great interest in connection with their unique properties, such as extreme strength, special electrical properties, high efficiency when used as conductors of heat, corrosion resistance, etc. They are able to impart new properties to already known materials even with a small addition and are indispensable in the design of new composite materials, including those based on metals, plastics, and polymers. New composite materials with specified properties can be obtained by inserting a small amount of CNTs. To improve the properties of materials, an effective chemical interaction between the CNTs surface and material matrix is required. Otherwise, the uniform mixing of CNTs with molten materials is practically impossible. To ensure the chemical interaction of materials with nanostructure surface, this surface must be modified.